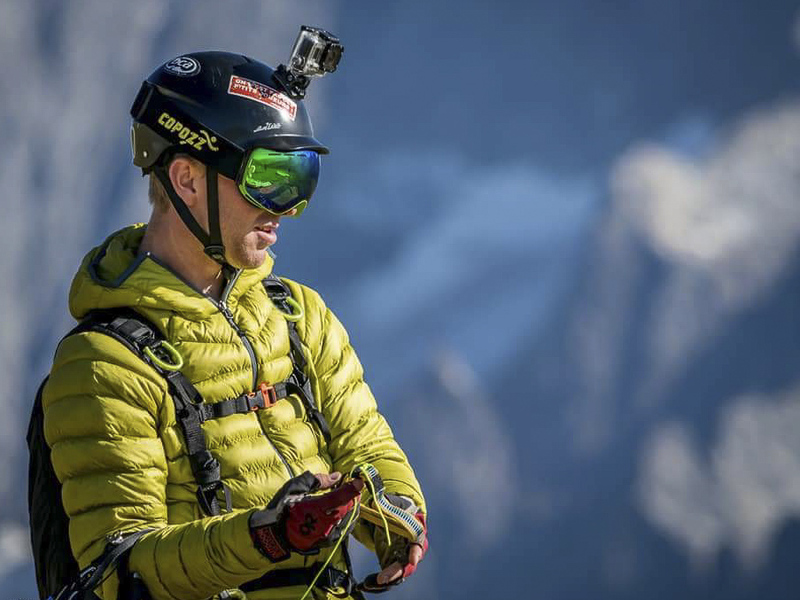 Pro Team member Willis Morris describes his rogue entry into the world of speedflying; teaching himself, with no previous aerial experience and fuelled by the desire to extend his day beyond the summit of a mountain. Like so many others I've always dreamt of looking down from above. Not from the wall of a climb but from the sky, soaring alongside the birds. Like most climbers I was used to being on the ground always looking up towards the surrounding mountains, eyeballing lines of routes that make their way towards the summits, forever planning the next adventure upwards. Unlike the others however, I always had a secondary process to my skyward examination. One that stemmed from my dream of flying. I would stare upwards finding the hardest line of ascent that I could link to a summit with a possible launch. A rounded top with enough space before an edge above an awesome descent. 15 steps was all I would need. Surely with enough effort and a fair amount of luck I could make this a reality? The most challenging way up, with the gnarliest way down... How hard could it be? I remember the variety of looks people would give me when I first told them about my plans to make this dream a reality. The majority of faces would scrunch up with confusion. Puzzled eyes would sit beneath a sturdy frown that would induce wrinkles above both eyebrows, caused by the unfamiliarity of what speedflying involved, beyond flight and speed. Then of course there were the faces of enthusiasm. Usually from close friends that had involvement in the birth of the idea. Inspired smiles would form to greet the news that the idea they had encouraged was materialising. Finally there were the faces of distress. Mouths often agape with genuine concern, fear emerging through their eyes. These usually formed on people with knowledge of the sport. Those that knew the danger involved and the radical leap I was taking having no previous experience of aerial sports. Those that doubted I could manage it. From the very start there were people with doubt and negativity towards my entry into the sport of speedflying. I guess it was a reaction to my rogue approach; buying a wing and going out on a hill, self-taught. 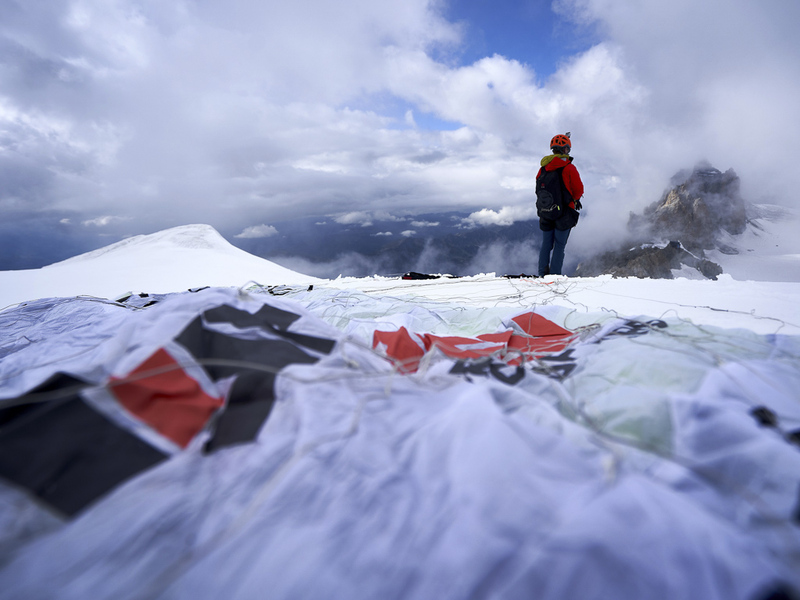 To give some context, speedflying is to paragliding as BASE jumping is to skydiving. 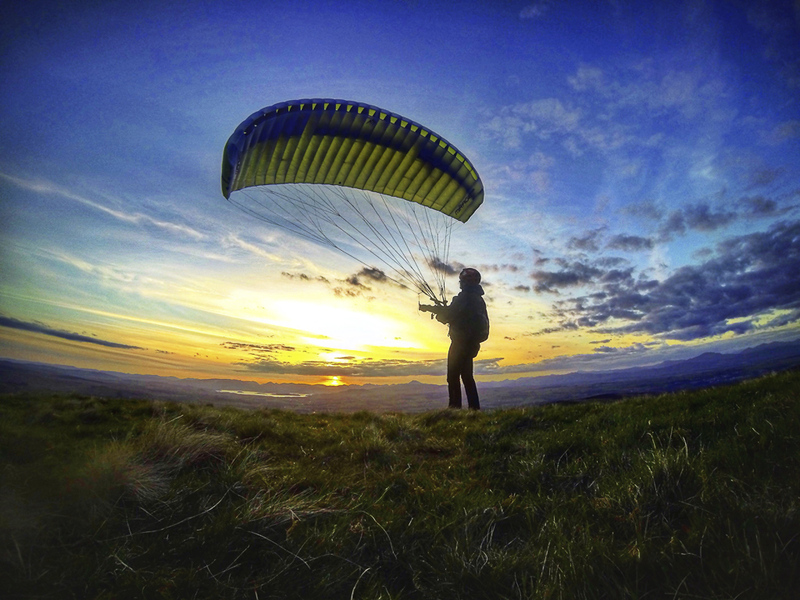 Most people that step into the niche of flying these small, high performance wings come from a paragliding background, with hundreds of hours of experience in the air on big wings before making the step to downsize to a speedwing. Still to this day I've never been on a tandem flight nor flown a paraglider. So why not go paragliding you ask? Well, it just never appealed to me. To start with they're big and heavy, the complete opposite of what I required if I was to combine this new form of descent with a climb. 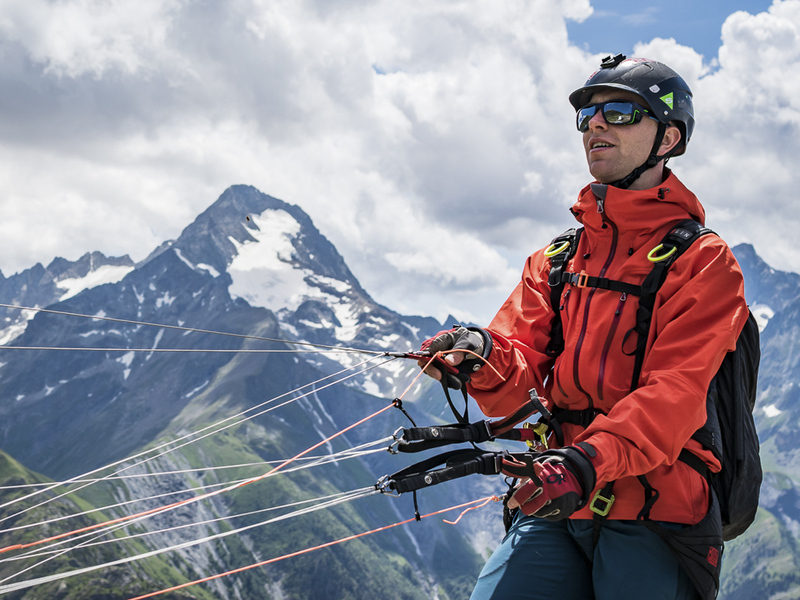 Secondly, they're the opposite of what I wanted out of flying, with safe floaty take-offs and a smooth and relaxing ride down into the valley, paragliding was my idea of armchair flying. I needed a rush. I wanted speed and proximity to the ground to scream down the couloirs I had just ascended. I wanted the descent to match the thrill I felt on my hardest climbs. I wanted speedflying. So I decided to become the black sheep, ignore the rules and carve my own path towards my dream of flying, one that would increase the risks but remove the red tape and regulations that stood in my way. Starting out was a disaster. Unbeknown to me, the wing I had bought was outdated compared to the equipment that was available. It was almost impossible to launch in anything but perfect conditions, unpredictable once in the air and harder to land softly than a sack of bricks. I persevered, narrowly surviving several near misses before receiving help from a few local pilots to get myself sorted with a state of the art wing, one that would really allow me to put everything I'd learnt so far into practice in a modern and safer style. Regardless of this sensible stepping-stone and my progress, I was still plagued by doubters and disbelievers, telling me I was crazy, stupid and risking the reputation of the whole sport. People refused to fly with me, knowing I was self-taught. I realised that progress was too slow if I just took small pieces of advice whenever people would offer it. My drive and determination to fly meant I needed to immerse myself completely and to create my own style of learning. I needed a high stress environment, something I have always managed to thrive in. Every day started with a meticulous analysis of multiple weather forecasts cross-referenced against maps and 3D models of mountains. I learned the statistics of every hill within driving distance; temperature, cloud base, wind speed and direction. I forced myself to be on the hill everyday, a 90% chance of rain in the forecast still meant there was a possibility it could turn flyable. Split shifts at work were bookends to a frantic drive out to the nearest hill, all just to gain a mere 30 minutes of practice. With this glass-half-full outlook, I ignored those that doubted me and tried to enjoy the experience rather than feel the stress. I was committed, regardless of the danger. With this I was able to relax even in the most stressful times and analyse every detail of each flight, every minor mistake or accident was studied to make improvements. Progress was faster than anyone believed or could have predicted. It wasn't long before I started to push my limits, opening new and difficult launches, downsizing wings and increasing my proximity to the ground. One year to the day after my first flight and I was the most current pilot in the UK with 365 flights under my belt in the same amount of days. Now, two years on from my first flight, I'm flying a pro-sized wing and holding my own with the top names in the sport. Dreams can be hard to achieve, your progress will always be battled by others' negativity and doubt. Sometimes it can be so contagious that it infects your own confidence and belief of success. Failures will inflict fear, which easily leads to mistakes. Injuries will set you back and weaken your will to accept any risks that you'll need to overcome. Chasing your dreams, you'll consistently think you are crazy. Dreams are an easy thing to have, they're created in an alternate reality where these limits and obstacles cease to exist. It is not natural talent or skill that can make them a reality. In my experience, it's only a determination to persevere against anything that stands in the way and break the rules and boundaries of what is possible. To have a stubbornness to negate those who doubt you and excel past every low expectation, without fear of being the first to achieve it. It's having the ability to force your own luck and maintain a drive to accept nothing but the faultless reality of your dream.